Hi! Today I have a card to share, which I've just made for the Create: blog's challenge for this week: using rolled paper on your cards. I've loved those beautiful rolled paper Christmas tree cards we've seen this year, but I didn't feel like creating a Christmas card right now, so I decided to go for a different shape and made a rolled paper heart. I used all scraps from my "tiny scraps box" so I am VERY happy. After I created the heart (and it took me several attempts), I used my Silhouette to cut the beautiful Lori Whitlock birds that I then pieced and embellished, and finally added some very, very old American Crafts ribbon with the word LOVE as a sentiment. I have several projects that I have finished these days but cannot be posted yet because of DT reveal deadlines and such, so there will be lots of new projects in the following weeks if you'd like to come and have a look. Really really beautiful card! Me encanta cómo has hecho los rollitos para que encajen con la forma del corazón! Muy original e innovativo! This is darling!!! I love that you used the rolled paper for the heart and the birds are too cute! Lovely card! What a unique and beatiful way to incorporate rolled paper into your card. You rocked it! Gorgeous!! I love how inovative you were to take the idea from one project and use it in a new and creative way!! Great job! Love that rolled paper look! 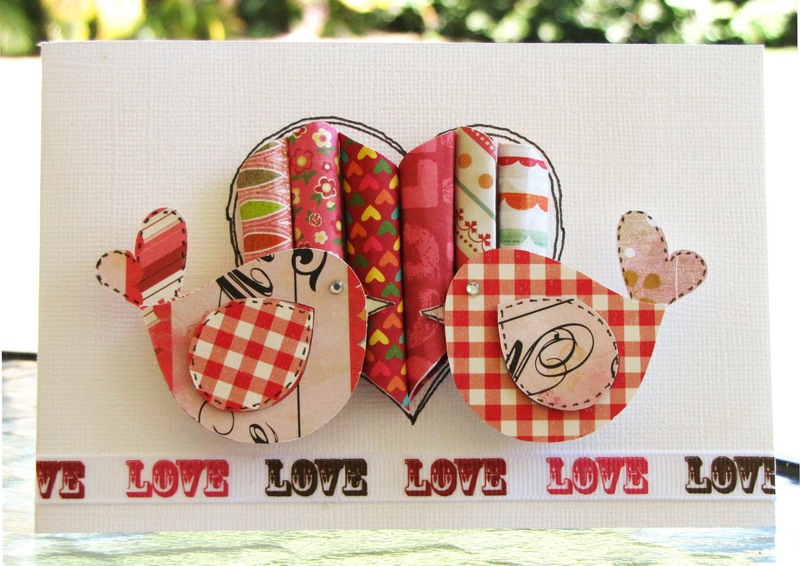 It is just perfect for a card and absolutely adorable as the heart on your card. Love the little birdies too! How do you do the rolled paper? I love this idea so very cute. Fou d it on pinterst. I was not very smart and rolled them all around a pencil individually, drew the heart and cut them to measure. I have seen now that other scrappers roll the paper, then glue them all, and then cut them into shape. Much easier!